In the pet world cats fill a niche between hands-on animals like dogs, and fish, which are difficult to interact with. 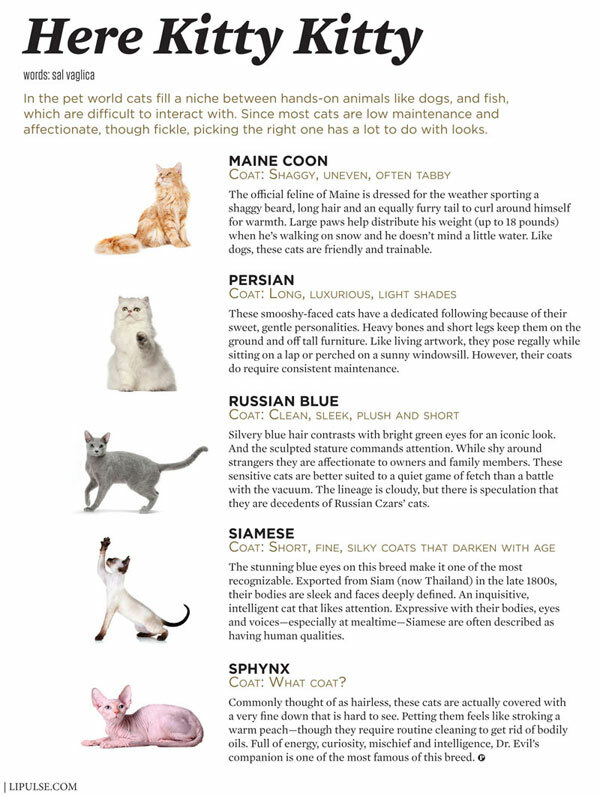 Since most cats are low maintenance and affectionate, though fickle, picking the right one has a lot to do with looks. The official feline of Maine is dressed for the weather sporting a shaggy beard, long hair and an equally furry tail to curl around himself for warmth. Large paws help distribute his weight (up to 18 pounds) when he’s walking on snow and he doesn’t mind a little water. Like dogs, these cats are friendly and trainable. These smooshy-faced cats have a dedicated following because of their sweet, gentle personalities. Heavy bones and short legs keep them on the ground and off tall furniture. Like living artwork, they pose regally while sitting on a lap or perched on a sunny windowsill. However, their coats do require consistent maintenance. Silvery blue hair contrasts with bright green eyes for an iconic look. And the sculpted stature commands attention. While shy around strangers they are affectionate to owners and family members. These sensitive cats are better suited to a quiet game of fetch than a battle with the vacuum. The lineage is cloudy, but there is speculation that they are decedents of Russian Czars’ cats. The stunning blue eyes on this breed make it one of the most recognizable. Exported from Siam (now Thailand) in the late 1800s, their bodies are sleek and faces deeply defined. An inquisitive, intelligent cat that likes attention. Expressive with their bodies, eyes and voices—especially at mealtime—Siamese are often described as having human qualities. Commonly thought of as hairless, these cats are actually covered with a very fine down that is hard to see. Petting them feels like stroking a warm peach—though they require routine cleaning to get rid of bodily oils. Full of energy, curiosity, mischief and intelligence, Dr. Evil’s companion is one of the most famous of this breed.